Your extra large pepperoni pizza is about to get a sweet new ride. 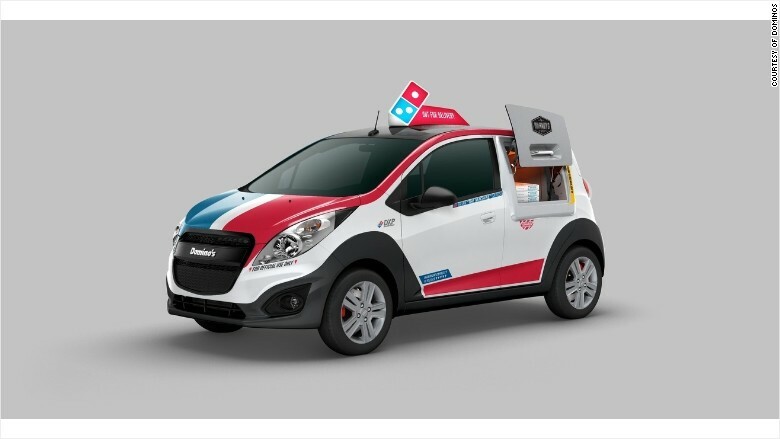 Domino's announced Wednesday that it would launch 100 custom pizza-delivery vehicles in 25 markets across the U.S. The vehicles, known as the Domino's (DPUKY) DXP, are modified Chevrolet Sparks outfitted with a warming oven and extra storage areas in the front and back. The company said the only seat in the car is the driver's. Domino's said the vehicles can hold up to 80 pizzas at a time. "The Domino's DXP is the first purpose-built vehicle aimed at revolutionizing pizza delivery," said Russell Weiner, president of Domino's USA, in a news release. "This innovation allows drivers to do their jobs with greater ease and efficiency, and demonstrates that Domino's is absolutely fanatical about making perfect deliveries." The company said some of the markets receiving a DXP include Boston, New Orleans, San Diego and Detroit. The vehicle is Domino's latest attempt to up their game in the pizza-delivery business. Domino's started letting its Twitter followers order pizza via the social media platform in May. The followers can order a pie by tweeting a pizza emoji, Domino's spokesman Tim McIntyre said at the time.